Covey’s 1-4 where to be in the open today, so at least I would avoid Covey 5 for a change. The lakes had thawed out for today and a strong wind was arriving along with persistent rain. I drew peg 31 which I didn’t know much about as I haven’t fished Covey 2 for a few years. I had noticed that Andy Bennett had got 2nd from peg 34 the week before so hopefully I was in a good area. 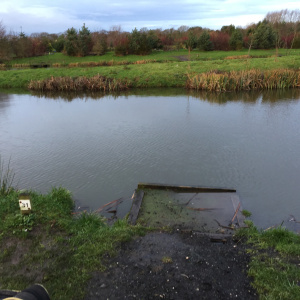 Peg 29 was in and there was a gap of 2 pegs to my left before the angler on peg 34 and before the match I could see Andy Bennett offering the angler some advice, he was pointing towards the pallet of peg 35 and across towards the split (mental note made).